Crowd Chamber is an audio plug-in that layers multiple variations of a signal to create a crowd simulation. Up to almost 2,000,000 layers can be produced enabling simple chorusing effects, small crowds and stadiums, on to impossible situations and effects. When each voice is mixed, it is altered in varying time and spectral content, making unique versions of itself to create the illusion of different sources. This effect can be fed back onto itself to create many thousands of voices in real-time. Once the concept had been created it became clear that Crowd Chamber could create far more than simple crowd scenes. Because of the feedback, wave cancellations, and, simply, the thousands of layers, it is the perfect tool for creating strange and twisted effects. 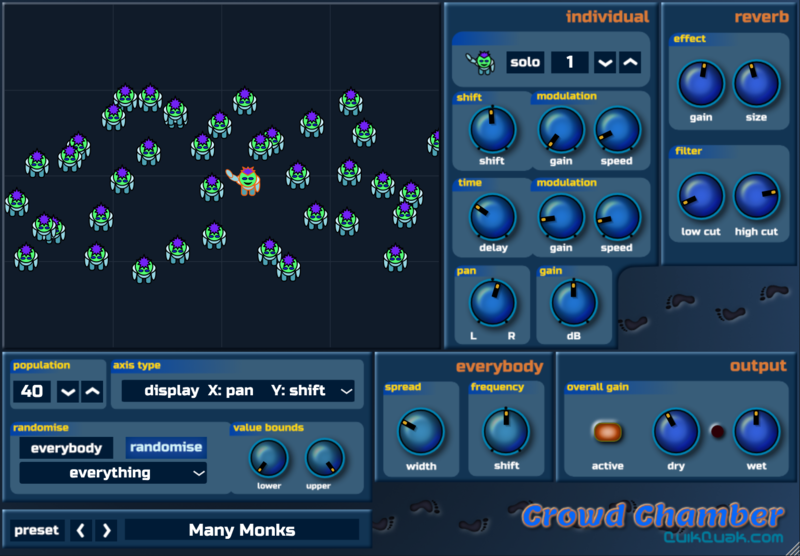 Crowd Chamber follows QuikQuak's other plug-ins with a visual, hands on approach. There is also a fast randomisation feature for rapid crowd creation. Simulates a crowd of up to 2,000,000 voices. Voices vary in spectral content and delay. LFOs for temporal changes in voices. Fast visual editing, with parameter randomisation functions. From simple chorusing effects, small crowds and stadiums, and on to impossible situations. Creates massive stereo sound washes, and extremely weird animal effects. 64 bit on Mac OSX. New reverb effect, increasing preset realism. Compatibility with latest Ableton Live and various control issues. Crash bug fix for Logic Pro, and other hosts.